Daddy took me for a walk in the deep snow yesterday - he was going so fast I fell off in the snow and started to cry. 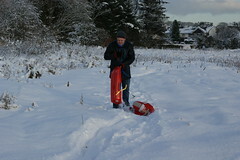 He had to pick me up and dust me off before putting me back in the sledge. After that he went very slowly and it was all fine.